I should have known. Listening to Shrimp for the first time I noticed how serious this album was. How utterly solemn the music of this band called A Tale Of Golden Keys is. Of course, it is from Germany. Beyond that my thoughts went in another direction: a Snow Patrol clone with at times better songs, perhaps because of the seriousness of the music. Where Snow Patrol more than once goes over the cliff of bombast or just remains plain dull. Somehow Snow Patrol has a hard time finding and sticking to the middle ground. This German band finds it more than once and plays within and with my comfort zone (for this kind of music). How does the album fare after more listening sessions? The start is so surprising. It sounds like the tune of TV series 'The Bridge' ('Hollow Talk' by Choir of Young Believers). That deeply melancholy song full of silences and suspense. A Tale of Golden Keys turns into another direction as soon as the band starts playing. The voice does keep the similarity going. And what an ironic song title 'Punk Rock Hit' is. The song certainly works towards a climax, but it is not one or at least not in the traditional sense of playing guitars loud and fast. A Tale of Golden Keys is a trio from the Bavarian countryside around Nüremberg. According to the band it is the countryside that inspired the music and singing on Shrimp. Listening from a great distance I can hear the spaciousness the mix allows the music. There is a place and time for all instruments and voices. The mix and sound certainly are the first two things that attracted me to Shrimp. The album's sound is so clear that it immediately attracted my attention. Or, no, that was the Snow Patrol likeness, but I have simply gone so far beyond the comparison that it's become inconceivable. The mix gives the music on Shrimp something mysterious and places it sort of outside of time. By creating the right circumstances the music can bring me in that place where nothing much else matters any more and time is stopped. "On my way out, I lost myself" is sung in 'Gospel'. It is the other way around. On my way in, I lost myself when listening to a beautiful song like 'Gospel'. There are several of these songs on Shrimp. The true beauty is released when I'm alone with it. In all other circumstances it is nice. The artwork is also great in all its simplicity. 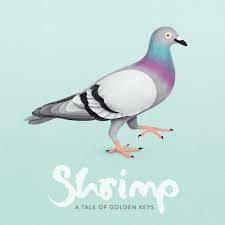 The symbolism of a shrimp and a pigeon eludes me though. It probably choked on it. The combination with purple vinyl is just so beautiful. A Tale of Golden Keys truly surprised me with the beauty of its music. The album grew on me step by step. Revealing more and more of its beauty with each spin. The album reminds me of the soft side of Madrugada, but even Saybia comes to mind as does Tim Christensen. All Scandinavians, yes. Showing that Shrimp has gone from the first influence reference to deeper and better influences. Giving its music unsuspected depth and warmth. The way some songs, e.g. 'In the Far Distance', are brought to a fitting climax, reminds me of the Norwegian progrock band Soup. Everything comes out to bring the album to an end in 'To Think', to end it with the words "Bring it back to square one". Indeed the little push I need to put it back on again. With the weeks I was able to listen to this album, I came more and more to the conclusion Shrimp is a beautiful album. Serious, yes, but so beautiful. How the band lays out the puzzle between the three of them with four instruments to play live (drums, bass, guitar, keys), is not for me to solve. On record it works like a miracle. A beautiful album from Germany. Not something I write every day on this blog, but totally deserved.